Once again, UCMP held its Annual Open House in conjunction with Cal Day. Despite the threats of rain and the gray clouds of taxes (Cal Day was on April 15th this year! ), several thousand folks found their way to the Valley Life Sciences Building to hold live snakes, identify local wildflowers, and enjoy the activities offered by UCMP. T. rex always merits ooohs and ahhhs and plenty of photo opportunities, but there were many other offerings from which to select. The Clemens and Barnosky labs hosted the ever popular Fun with Fossils activity up on the 3rd floor, while exhibits in the UCMP Fish Bowl focused on the emerging science of Astrobiology, the study of life in the universe. Displays by the Lipps and Lindberg labs included early life forms such as the Vendian specimens from the White Sea (~555 million years old), and the stromatolitic Gunflint cherts of Ontario, containing bacteria and cyanobacteria ~2 billion years old. The Padian Lab showed off fossil bones of organisms from different environments and time periods, including skulls of dicynodonts (extinct mammal relatives), turtles, the complete foot of an ornithomimid dinosaur, and more. 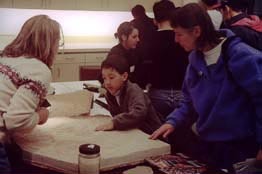 Jane Mason was back by popular demand to demonstrate her skills in fossil preparation. Those lucky enough to grab a ticket enjoyed the tours of the collections hosted by museum scientists and faculty curators, while others scurried to take advantage of a clearance sale of UCMP tee-shirts. The day culminated with a nearly full house to hear Jere Lipps discuss Astrobiology and the factors necessary to support life elsewhere. It was a high-energy day thanks to the enthusiasm of all the faculty, staff, graduate students, and volunteers who shared their interests with an eager public. 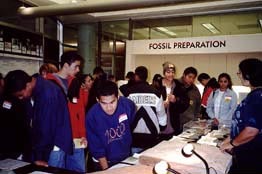 Crowds see displays on Astrobiology and demonstrations of fossil preparation. 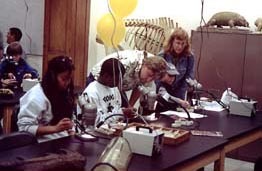 Cal Day visitors examine fossils of some of the earliest forms of life on Earth.